Krsna cannot be controlled by anyone or any means. But pure devotee’s love captures His attention, and He becomes controlled. Form and action follows primary principle of desire to please Krsna. Somebody who does not worry about the mood, just mechanics, still has that mood of only worrying about mechanics. Sarva-dharman parityajya means switching from the idea that mechanics is all in all, to pleasing Krsna. Devotion makes symptoms, not vice versa. Purifying the focus on mechanics. Masculine is situated in sambandha, focused on prayojana. Feminine is situated in prayojana, focused on sambandha. Interaction in abhideya is the common platform for them. The ‘couch potato’ is situated ‘below the modes.’ Existence without transcendental knowledge is in the mode of ignorance. This type of masculine existence does not include Pradyumna, so there is no connection to prayojana, therefore it makes women insecure. Women will then try to move the man’s position from Sankarshana to Pradyumna. Krsna never goes in Sankarshana mood when He is with His energies, but the gopis accuse Him of this after His disappearance from the Rasa dance. But Radharani never questions Him, therefore Her love is the greatest, therefore everyone should serve under Her. If one does not want to follow the rules, one should just manifest one’s spiritual form, just as Srila Vishvanatha Cakravarti Thakura when caste brahmanas wanted to kill him. Since we don’t yet have a spiritual form, we use the form we currently have in Krsna’s service. If gopis would be allowed to freely move around, what would be the value of the parakiya rasa? There are rules to create rasa. Nobody normally goes out in the middle of the day, so gopis go. Parakiya-rasa gets intensified by rules. If there would be nurses, how deep would mother Yashoda’s love for Krsna be? She has her helpers, but mostly does everything herself. We must focus on creating brahmanas, not on shudras in the management. There are already leaders in each rasa, and nobody can become equal to them. There is always the principle of following in the footsteps of superior devotees. We do activities that match our position, with facilities provided by Mahamaya, since we don’t have the facilities of the Vrajavasis provided by Yogamaya. We don’t imitate, but the effect will be that of Yogamaya. Unless we are liberated, meditating on doing something in the spiritual world is sahajiya. If we project ourselves in the pastimes, they will disappear. Our acting in our spiritual form will come in its own sweet time, literally. Those who are qualified won’t speculate, and those who speculate are not qualified. Meditating on mother Yashoda because ‘we should’ is still vaidhi. We are thinking that raganuga bhakti is created by externals because everything in society is. We are trying to put in a gross framework something that is so subtle. Before puberty the training of the girl is just about good qualities, afterwards she can understand the deeper meaning of chastity. The shape of the grinding mortar; Krsna would turn it around and climb on it. Mother Yashoda cooks the milk in a huge pot, so she is not able to handle it while also holding the baby. Nanda’s and Yashoda’s love is far beyond what anybody else can ever achieve. Mother Yashoda was herself engaged in various household works, doing whatever was necessary. Meditation is done individually. In a group there is Hari-katha. Butter from yoghurt cream is better for salty items. Mother Yashoda would herself compose songs of Krsna’s pastimes to remember them. It would not be uncommon for people in Vedic times to speak in verses. The acaryas have composed enough songs, and then there is all the Vedic literatures, so we don’t have to invent our own. The systems of artistic expression are already fixed. One just has to learn them and learn how to use them. Akara – repetition of some parts of the songs in a particular way, such as ‘madhur madhur madhur bhaje’. Popsongs about Krsna may not carry the cit potency. We should not associate too closely with nowadays Vrajavasis. We should not imitate or buy their songs. We should follow in the footsteps of mother Yashoda in how to remember Krsna. In South India flowers in the hair are considered dressed hair. Many ornaments keep the feminine nature peaceful. One should meditate on mother Yashoda, but not try to become like her. The Vedic system only has adult education, children learn aspects of that according to their ability. Butter is churned early in the morning, then it is better. Mother Yashoda’s prema is so strong; she was so concerned about Krsna’s food that temporarily she neglected Krsna Himself. Krsna guides the devotee what to do when best. Taste is more important than the chronology of items. Mother Yashoda is a much greater yogi than the yogis. Any path outside of parampara is the wrong path. There are many great personalities who know about Krsna from scriptures, but without any connection to parampara they don’t surrender. They read all the things, but don’t know what they are meant for. The only purpose of the material world is to get out from here. Most of the needs in the modern society are engaged in a sinful way, while in the Vedic society they are engaged piously. The temporariness of the world is not important, if things are engaged in the Lord’s service. The essence of Bhagavatam is the 10th canto, the Lord’s smiling face. That’s where our focus is. In kriya-shakti knowledge is applied. By knowledge we should give up desire for control and enjoyment. The Lord is always caught by mother Yashoda’s devotion. Time and space actually don’t mean anything in the spiritual world. Devotees already live in the Lord’s effulgence. Only when there is a relationship, one is able to see the Lord. The whole universe is afraid of Krsna, but He had fear of His mother. Bhava extends down through stages of sadhana. People dressing up for Halloween as devotees still get benefit. As we take up our svarupa, we will appreciate the Holy Name more and more. Punishment is only there to get proper understanding. We are far from spiritual world only due to our consciousness. All aspects of Krsna are attractive, but there are certain ones that bring out particular rasas. Nanda Maharaja is not a follower of Vedic ritualistic ceremonies, he only uses them to please Krsna. The first stage in Vraja bhakti is to meditate on the love of the residents, no matter which rasa. In Vraja everybody are friends because they are all trying to please Krsna. Transcending karma, jnana and yoga doesn’t mean that we don’t engage them. Mother Yashoda has so much affection that she doesn’t even care who Krsna is. Krsna can be all the contradictory things at once, and it is always described. Time and space is Krsna, so nuclear physicists can never understand it fully. Krsna is unlimited, so an attempt to bind Him can only happen on the platform of pure love. The greatest possible difference exists between the masculine and feminine principles, so bringing them together generates the greatest pleasure. Making man and woman equal makes it boring. There are things that we can mathematically imagine, but they have no value for Krsna. Krsna has already chosen the best things. We are mature in our faith in lust. The potential of creation, maintenance and destruction is there in Balarama, but actually He does not do it personally, He just serves Krsna. Both Krsna and Radharani have nothing to do, so they are a perfect match. Iccha, jnana and kriya indicates the influence of energies; samvit, sandhini and hladini – their position. Krsna is controlled by love, but it is not that one actually controls Him. Krsna reveals Himself when He is pleased by our attitude. The ones who think that form is not important actually manifest the impersonal nature to the greatest extent, even though they consider themselves the most personal. Those who don’t understand Krsna’s personality, only see His effulgence. There are unlimited expressions of love for Krsna, but it has to be according to Krsna’s desire, not ours. Aropya means overemphasizing our own needs and desires and projecting that unto devotional process. The apasampradayas take a bonafide aspect of devotional service and overemphasize it to the point of absurd. Brahmacharis overemphasize the prasadam aspect. Mother Yashoda expressing affection for Krsna is prayojana. Her attempt to bind Him is a form of expression. Devotee is happy as long as he is focused on Krsna. When one focuses on being happy, happiness goes away because we are focusing in the past, and it becomes ignorance. Everything about Krsna is universal, but there are aspects that might work just for us. It is probably due to lack of association that devotees take some aspects and overemphasize them, forgetting the whole picture. Mother Yashoda is only concerned about the welfare of her son. The two finger length that was lacking was filled up by devotee’s endeavor (parishrama) and Lord’s mercy (kripa). Pure devotional service manifests more or less according to the influence of the time factor. One cannot actually have proper conversations with politically correct people, because everything we say will be used against us. Nowadays preaching can be done in a more nice, polite way, since there is no emergency, but it doesn’t mean that one is not straightforward. When there is steadiness, or faith for the devotee and it is combined with steadiness of the Lord, then the Lord shows His mercy. The effort devotee makes is an expression of devotion. When we simply try to use logic and intelligence, we can never understand Krsna. We only understand if He allows. In the Vedic system the ability to reconcile contradictions is considered a better position than being able to find them. If the Vedic things are not connected to Krsna they are useless – but we only get the ‘useless’ part. Daksha is the most expert, but he is not a devotee. Devotees’ devotion, not action catch the Lord, but pure devotees’ actions are based on their devotion, so they are not different. We only have to separate between primary and secondary if there is some problem to sort out, otherwise not. Control comes through service and surrender. Technically properly done activity without a proper attitude does not give good experience. Control is overrated, Lord controls everyone, but He desires to be controlled by His devotees. Except for Vrajavasis, nobody works purely based on affection. There are 3 kings overseeing Vrindavana – Nanda Maharaja, Vrshabhanu Maharaja and Govardhan Majumdar. Varnashrama is actually only meant for the expression of rasa. It creates all environments for that. Those who don’t care for the rules, strictly stick to their own rules. Contradictions can give profit, but if one doesn’t know how to use them, they give losses. Political correctness is hermeneutics how to interpret words according to political position. Association with devotees create everything else in devotional service. Our position in spiritual realms depends on how we identify ourselves. 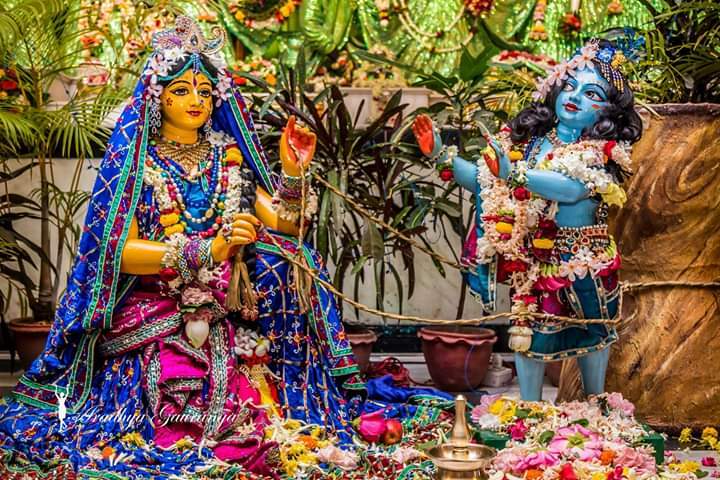 Prabhupada has given us everything needed to go to Vrindavan, but we like digging around and finding other things that are actually not needed for that. Srimati Radharani is the only direct servant of Krishna. All others are servants of the servants. Raganuga bhakti is not about tricks. We will always be following the footsteps of superior devotees. Once one gets to that platform, there is technically no difference between Ragatmika and Raganuga. Krsna can hear our prayers; we do not have to worry about it. Krsna already controls everything, so for Him it is more interesting to perform human pastimes and be controlled by His devotee’s pure love. Bhava is still considered sadhana-bhakti. All Srila Prabhupada’s purports give a consistent flow of thought. Women do not like men naked, even if women themselves are naked. A curse by devotee is always beneficial. One who does not take up devotional service after coming in contact with devotees is a naradhama. Misbehaving kids called naradhama in India. Narada Muni was not actually angry at the 2 sons of Kuvera, he just wanted to benefit them. Arjuna trees have some medicinal properties, but otherwise they are devoid of opulence – no fruits or flowers. Krsna sets the standard of what is right and what is wrong. Human beings should only eat food offered in sacrifice. How do we know if Krsna really accepted our offerings? It is not volume that matters in devotional service, but we have been trained to think like that. If one acts or preaches against the direction of the acaryas, we can understand that they are influenced by rajo-guna ando tamo-guna. Since we are only assisting the Guru, there is nothing to be proud of. When we wonder why things are not going well materially despite our spiritual practice, there is nothing transcendental about that doubt. Materialists only have a veneer of good qualities. With less possessions one is engaging senses less, one is less violent, so there is less pride. Modern ideas and identities are not helpful for improving devotional service. We have to use the traditional culture. Intoxication is bad, but not as bad as pride. Narada Muni speaks of advantages of being poverty stricken. Someone who is poor automatically performs austerity, so they develop the same qualities as saintly persons who perform austerity voluntarily. But because their consciousness is not involved in such austerity, they may abandon the proper behaviour if the situation changes. We should aspire to eat enough, not more or less than required. Modern society only has flavours of true ashrama relationships. Restrictions create relationships. Our restriction is someone else’s facility. When one is tolerant one can have other saintly qualities also. Enemy is someone that we are not tolerant of. Even if karmis manifest good qualities they are not worth associating with because their niceness is only for sense gratification. The position of devotees should always be appreciated, even though there are some weaknesses. Culture takes a long time to establish, but Krishna consciousness can be established immediately. If we want to avoid devotees there is no place for us to go in the spiritual world. Political correctness is atheistic if used as lifestyle. It may be a tool, but not a goal. It is rare to meet people on prana-maya platform who are actually nice to everyone. Internet was meant for business, not to replace personal interaction. In understanding scripture we always have to use the perspective of the acaryas. Several saints also walk around naked, but due to their purity nobody cares. Children are born in devotee families to further their devotional service, otherwise they would have been born somewhere else. Demigods are arms of the Lord’s universal form, but as a person He does not care for them much. Krsna is pleased by people taking shelter of devotees. Pure devotees move through the world only paying attention to situations that can be engaged in Krsna’s service, just as conditioned souls only pay attention to situations of sense gratification. One who simply doesn’t know is a mudha. One who is explained but rejects is a naradhama. The context of piety within the material world is still that people are all prisoners. Other than by the mercy of devotees there is no way to understand the nature of the Supreme Lord. Normal punishment for walking around naked is to become a tree. But by the mercy of Narada, Nalakuvara and Manigriva were also allowed to be conscious and see Krsna. The more one becomes proud, the more there is madness, or pramada. In pride we think we are special and stop performing proper activities that move us forward. Punishment is a normal case in the material world. Any type of siddhi is only achieved by the mercy of the spiritual master. Narada Muni gave qualification to Nalakuvara and Manigriva when there was none. The most wild cases of devotees are Narada Muni’s disciples. The Yamalarjuna trees were probably not hearing and seeing, but they were purified due to residing in the Dhama. The more realized one becomes in Krsna consciousness, the more one actually sees everything in connection to Krsna as sarvam khalv idam brahma. Those who are interested in trends are not actually into success, they are only interested in what is going on right now. Vaishnavas are well-wishers of everyone, so if we are only well-wishers of a few, we have not reached that platform. Just by seeing people who are above respect and disrespect, one gets benefit, whether one thinks nicely or badly of them. Nobody actually likes what everybody else is wearing. Culturally intolerant people are low-class. Offense is temporary, but exposure to the Holy Name gives eternal benefit. Having come to the platform of always remembering Krsna one does not fall away. Development in devotional service has absolutely nothing to do with one’s material qualifications. The devotees understand the conditioned nature they are dealing with, they are expert at engaging people. We cannot do anything to become a krpa-siddha, we have to follow our sadhana. People in China only dislike Indian politicians, it has nothing to do with culture. Krsna is just the best generic term for God. Vedanta goes beyond the mundane, so everything can be explained by it. Krsna is bound by the love of mother Yashoda. Neither Nalakuvara and Manigriva, nor Krsna’s friends could untie Him. Only Nanda Maharaja could do it. Gopis asked Krsna to bring them things simply out of affection. Krsna does everything just for the pleasure of his relatives, so His activities are very, very attractive. The Lord is the cause of all fruits, but He acted as if He needed some fruit. False ego of thinking that we are able to benefit the Lord, or that we don’t care for the Lord is quite useless. The Holy Name is both the process and the goal, but none of other religious processes are. Rohini is there in both Vraja and Dvaraka pastimes. But her affection is less than that of mother Yashoda, so she follows mother Yashoda. Even though mother Yashoda is firm, she is still polite. On one’s birthday one is supposed to do more sacrifice, charity and austerity. Everyone in the material world is making big plans, although their size differ. People are bewildered because they do not know that they are just the instrument of material nature. The Lord’s impersonal aspect is spread everywhere, but it does not mean that the Lord is impersonal. Everyone has an impersonal aspect. Perceptions of qualities is impersonal, but qualities have their personal applications. First 6 cantos describe samanya-bhakti – what devotional service is and what it is not. Anger should be overcome with intelligence because in anger intelligence goes. One should take things to a higher platform. The modes have nothing to do with the real nature of the Supreme Personality of Godhead. Yamaraja is death personified, and he does not get stopped by anyone. The chanting of the Holy Name is not restricted. No rule given in the Vedas ever get in the way of devotional service. They only get in the way if we think they have the same value as bhakti – we trip over our own low consciousness. We should work on yama and niyama, not on rights. Leadership may do the best they can, but even during Lord Caitanya’s time there were people like Ramacandra Puri – to show that we cannot please everybody. We cannot satisfy anybody on the material platform – the material modes can turn things around too quickly. Who are we to expect something from the devotees? Canto 6 explains how the Duties of Mankind is to connect themselves to the Supreme. Prescribed duties are posana – how things are maintained. We are supposed to learn how one who did something wrong will still be protected. The person doing wrong should be corrected, and also those who think that such a person cannot be corrected should be corrected.